Welcome back to the Lost Coast Portal to Creativity where Lost Coast Designs and Carmen's Veranda collide to bring you twice the inspiration and double the fun! 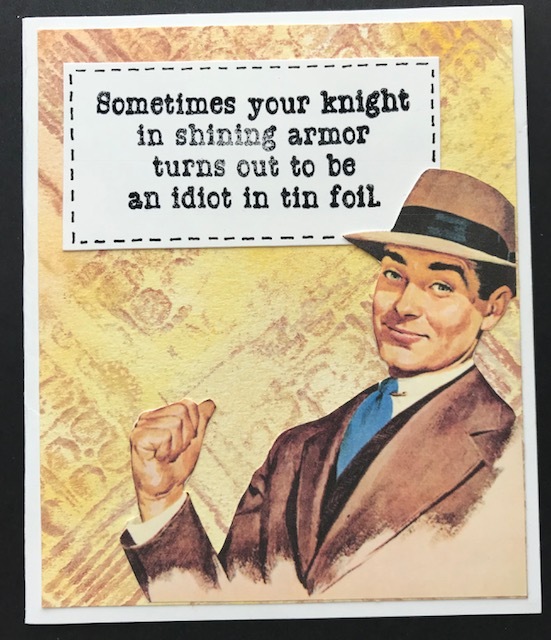 For this one, I used the Knight in Armor saying. I started with a yellow and brown background that I created with my Gelli plate and some brown and yellow paints and a stencil. I cut it to fit my card front. I then cut out a delightfully cocky gentleman from an Alpha Stamps collage sheet and positioned him in the right corner. 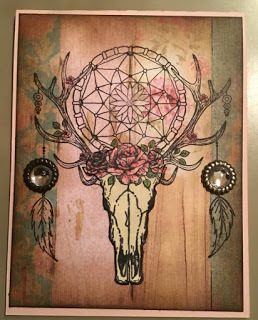 I stamped my sentiment with black ink onto a white square and added some "stitching" around the edges before attaching it to the upper portion of my card front. 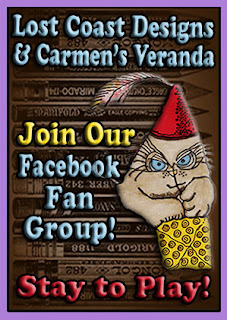 So come join the challenge and you may win some free stamps from Lost Coast Designs and Carmen's Veranda! Good morning and happy Wednesday, it's Sue here with my 'Say What' project. 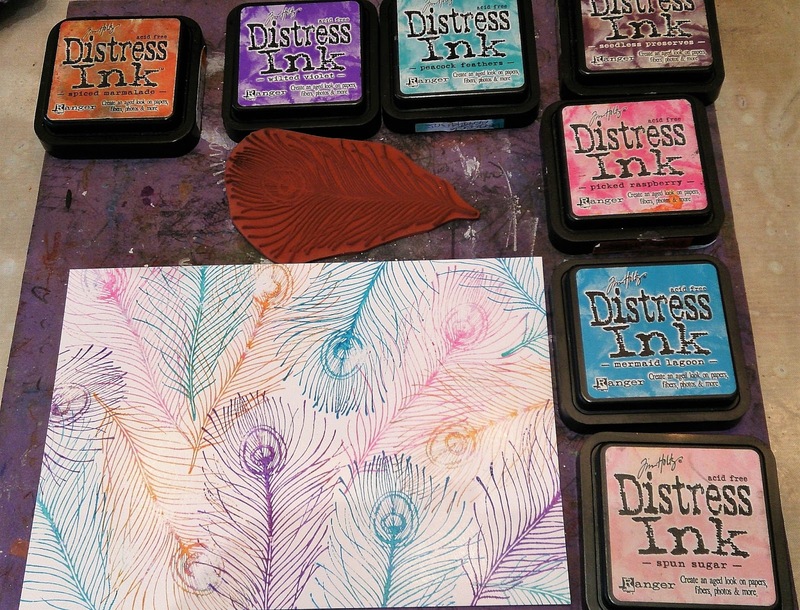 I started with lots of Distress Inks, and this beautiful Carmen's Veranda Peacock Feather. Now I could never pick a favourite stamp, but if I could this may be it! These Showgirls just make me happy! I just added some feathers (no purple birds were harmed), some silver mirri card and a bit o'bling, and we're all done. There's still a little bit of time to join in with our fun challenge, so I hope to see you over on the portal. 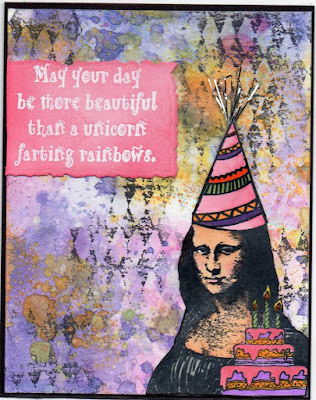 Cathy here to share my card today with you all. I hope you are all having a great day and get a good chuckle from this card. 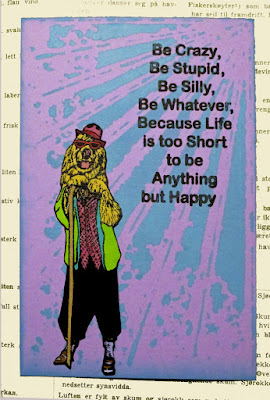 This saying makes me smile every time I read it. First I stared making this card by grabbing some watercolor paper and my Distress Oxide inks. 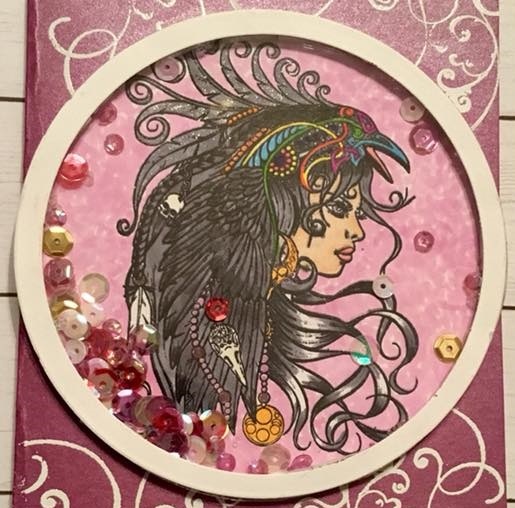 I did the smooching technique on the craft mat to get my background to the way it is. 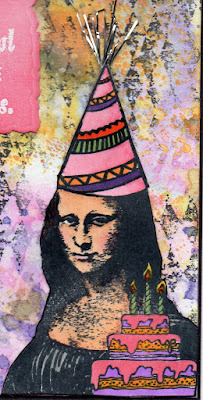 Next I took Grunge Diamond Background stamp and some black ink and randomly stamped it all over the background. I took the Farting Unicorn saying and stamped it with Versafine ink on pink cardstock and I used white embossing power. Then I took a die and cut it out and used Distress ink and inked the edges of the saying. 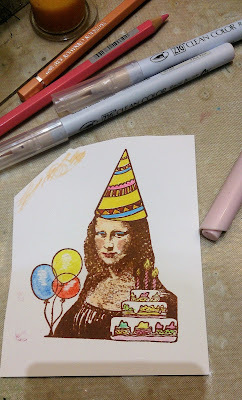 I stamped Birthday Mona on white paper and colored it with Copic markers using colors to work with the background I made. I cut it out and I added some tinsel to the top of the hat. 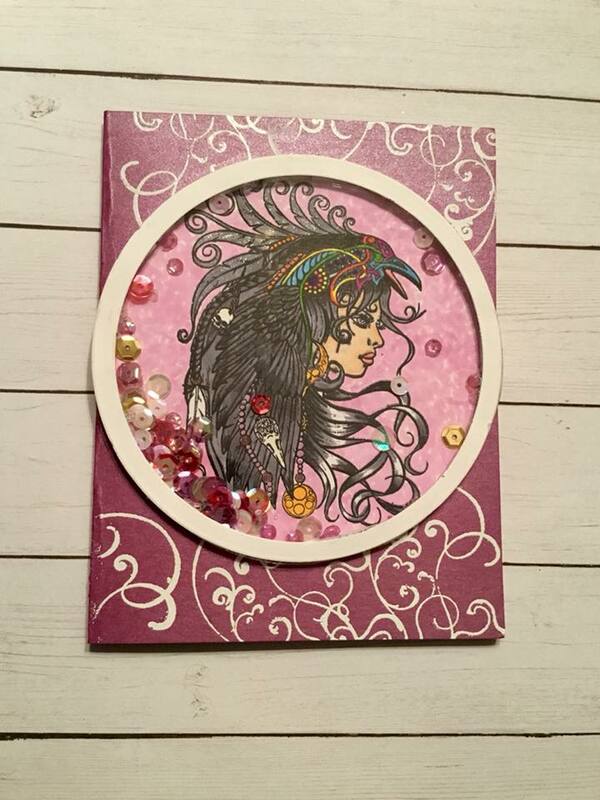 Last I glued it all to the front of the card and then layered it on black cardstock. 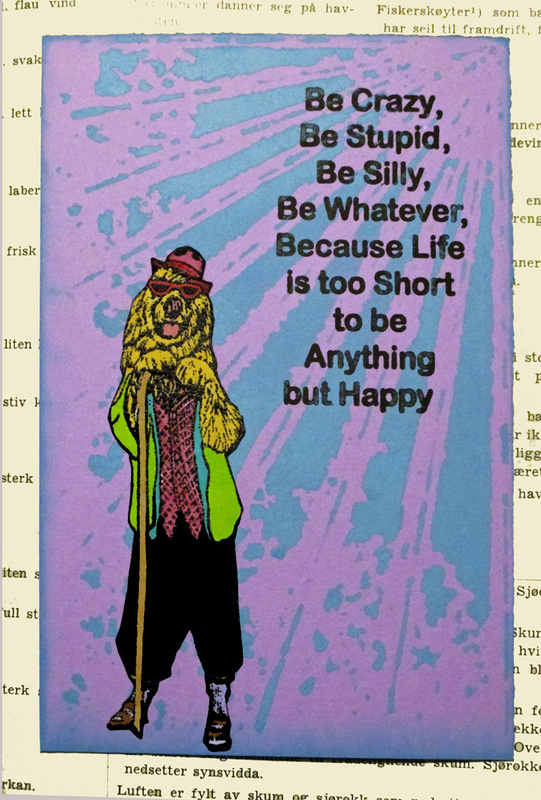 The saying is great for birthday cards or a card just to send a friend to make them smile. 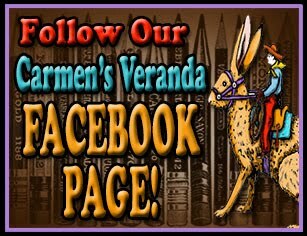 Go check out all the great saying at Carmen's Veranda shop. I think there is something for everyone. Last but not least come join us for the Say What?? challenge here. Hello. Gail here today with a clean and simple but wordy creation. 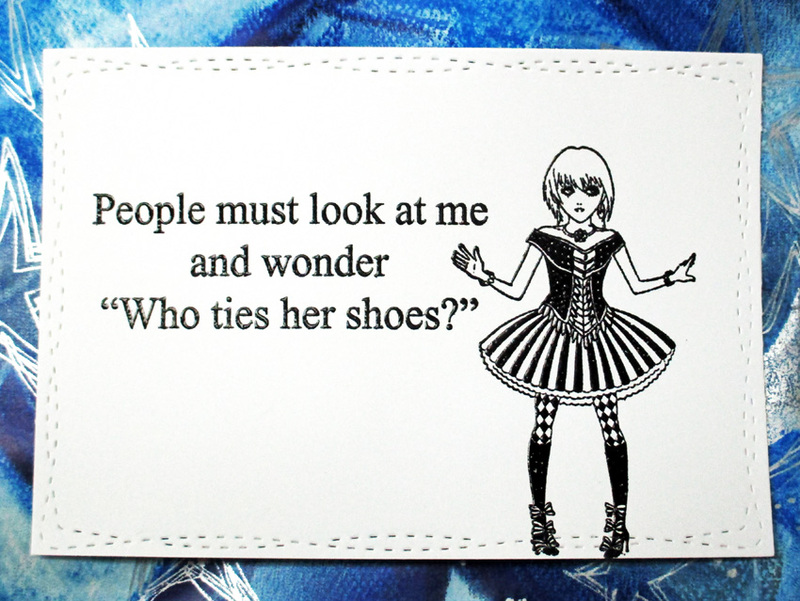 I simply cut my white base card with a stitch die, stamped Carmen's Veranda Who Ties Her Shoes sentiment and Lost Coast Designs' Mini Manga Goth Harlequin and embossed with black powder. 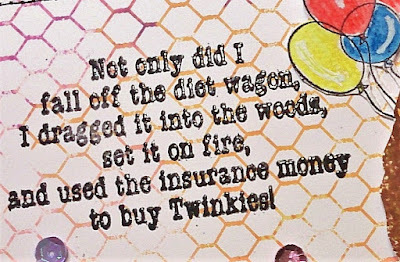 I know people who need this card!!! It's all happening here at the Lost Coast Portal to Creativity. Cathy here with a card for the Say What challenge. Winter is coming says the 3 eyed raven. This stamp Four ravens reminds me of the T.V. show Game of Thrones. First off I stamped She Loved the Sea saying with Versafine ink on the card to use it as a background. Next I stamped Winter is coming on a scrap white cardstock. Tore it out and colored it with distress ink. Then I made this wing with a mold I got. It had to dry for 2 days for me before I could paint it. I used black paint and then I used Opal Magic wax over top to give it the blue tint. I took the Four Ravens stamp and stamped it on copic friendly paper and colored it with copics markers. 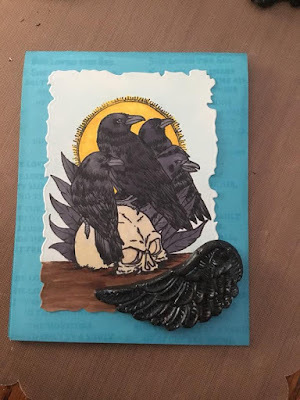 I cut out the Four Raven panel with a die and I glued it on the card then I took the dried and painted wing and glued it to the front of the card. I used foam squares to add the Winter is Coming saying to the top of the card. Can not wait to see your Say What?? project. You can enter here. 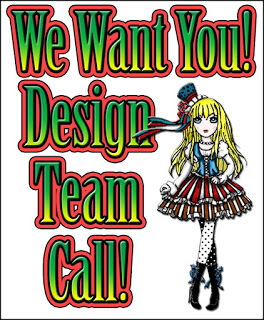 We are looking for a few new Lost Coast Designers to join our fabulous Lost Coast Designs/Carmen’s Veranda team! 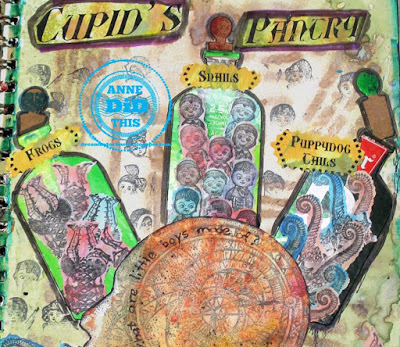 We are an enthusiastic and friendly team and would love to welcome some fun-loving stampers with positive, professional, no-drama attitudes, who love working with eclectic and quirky rubber stamps, to join us. This is call is open until 31st March 2018. We are looking for USA based stampers only at this time. DT term is one year. Please read over our DT Requirements carefully and consider your current obligations before applying. Joining a DT is fun and a way for you to share your love of creating but it is also a commitment. You are expected to do your best for our team regardless of how many other teams you serve on, so make sure you fully understand what being a Lost Coast Designer entails and feel free to ask questions if you need anything clarified. 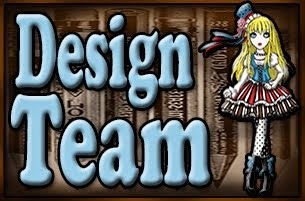 If you think our team is right for you then we’d love for you to apply by emailing Gail (craftynomad@gmail.com) Please put “Lost Coast Design Team Application” in the subject of your email and provide the following information. Thank you for your consideration and we look forward to meeting you all! Name, address, phone number (best number to contact you on if needed) and email address. Links to your online galleries, blogs, Facebook, Instagram, Pinterest, etc. List any Design Teams you are currently on and have previously been on. Please note that past DT experience is not necessary, all are welcome to apply. Include 3-5 project photos that best shows your style and quality of work (please keep file sizes under 300kB). Access to a generous selection of quality rubber stamps from Lost Coast Designs and Carmen’s Veranda at no charge. 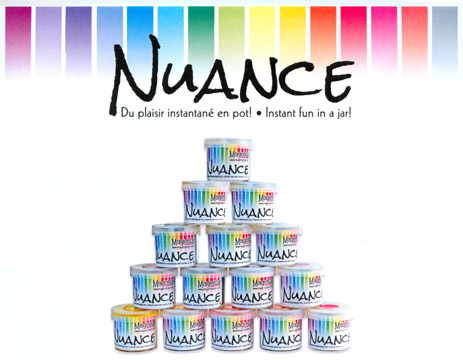 Access to Nuance Powders which are available to you at wholesale cost - use of these powders is encouraged but not a DT requirement. Your paper art projects proudly displayed at stamp conventions in the USA and Europe. Exposure on our Lost Coast Portal to Creativity event and challenge blog, Lost Coast Designs & Carmen’s Veranda company Facebook Pages and our Lost Coast Designs/Carmen's Veranda Facebook Fan Group. 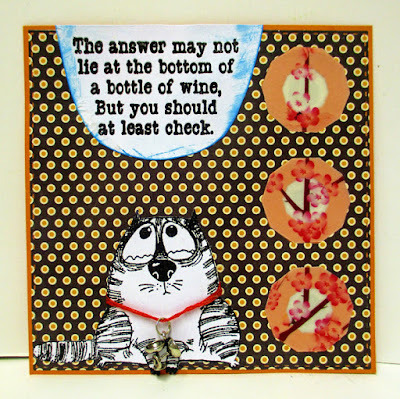 You get to create with and be inspired by a group of very talented stampers and participate in lots of fun events. Be able to work with all our stamp images, regardless of personal tastes and preferences. Have an active, up to date blog. We use blogger, so familiarity would be an advantage. Be a good communicator, reliable, dedicated & on time with deadlines and be able to work with themes in a team environment. You must be able to take good photographs to showcase your art well. Display 3-4 badges (3 permanent, 1 temporary) on your personal blogs to promote Lost Coast Designs/Carmen's Veranda and our various activities. Actively promote our stamps and activities on your personal blog, Facebook, Twitter or Pinterest, etc, as much as possible. 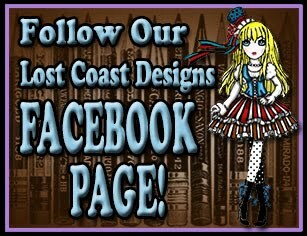 Be an active member of our official Lost Coast Designs/Carmen's Veranda Facebook Fan group as well as belong to our private DT group. Be willing to participate in various events like blog hops, etc. 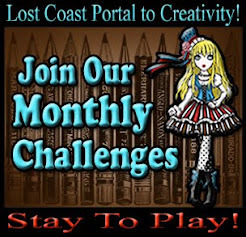 Share at least three project per month on our Lost Coast Portal to Creativity blog on assigned dates. Posts are to be engaging, written in good English, easy to follow, with info on what was made and how it was done, either as a brief summary or in tutorial form. In October we do an annual Halloween blog hop/event where we post everyday of the month. Additional projects will be expected at this time, split between the whole team. You are required to comment on challenge entries. You are required to mail in some none bulky paper art projects to Lost Coast Designs for display at our convention booths across the USA and Europe. Hello all again, from Laurie. 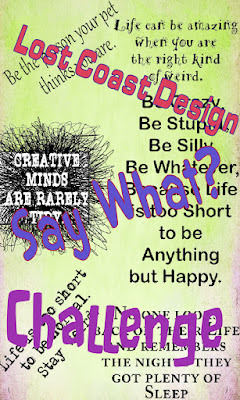 The latter half of March we are featuring a challenge called "Say What??" where we are highlighting the great and plentiful clear word stamps from Carmen's Veranda. If you have not checked them out, be sure you do! 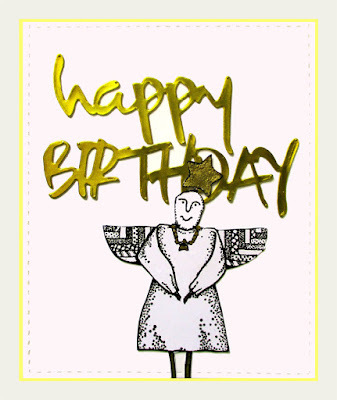 If you have made a card, etc. for someone and can't find quite the right sentiment, you will surely find it at Carmen's Veranda. 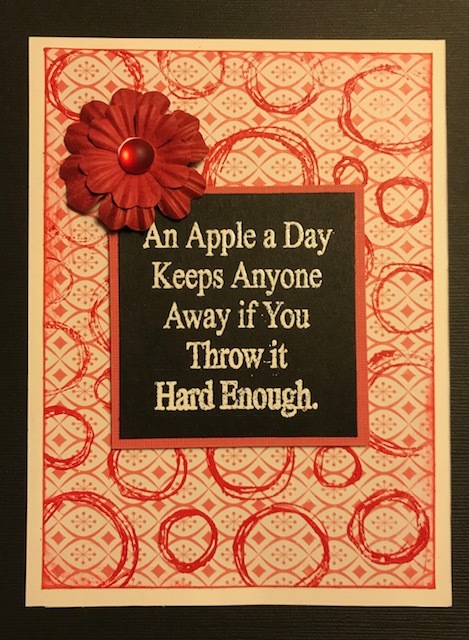 For this card, I used the An Apple A Day clear stamp from Carmen's Veranda. I used white embossing powder and heat embossed the sentiment onto a black square. I layered that with a red square. 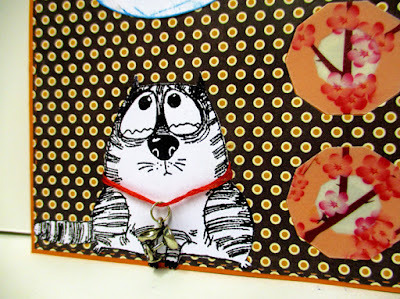 My background is a piece of red and white scrapbook paper that I stamped using the Doodle Circles background stamp. I used red acrylic paint, and with a brayer, rolled the paint onto my stamp then pressed my paper onto it to transfer the pattern. I edged that piece with some red ink and mounted it to a white base. I attached my sentiment piece with foam tape and added a red flower to the upper left corner. I really think this saying will put a smile on just about anyone's face! Please join us on the Portal and show us your "Say What??" creations! Hello. Gail here today to share one of Dr Frankenstein's lesser known creations bwahahhahaaahaahhaaa. Did you know Dr Frankenstein loved Hawaii? 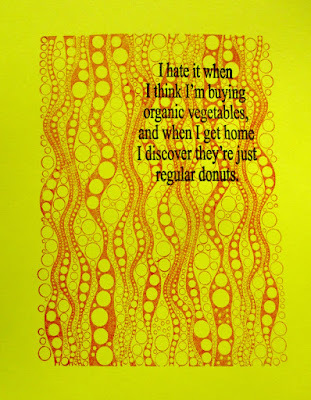 And pineapples!! Very partial to pineapples. I started with an oversized piece of bright yellow card and stamped Lost Coast Designs Bubbles Background with Spiced Marmalade distress ink. Then I stamped Carmen's Veranda Organic Vegetables with black archival, covered it all with clear embossing powder and heated. I did try stamping the bubbles and embossing, then stamping the sentiment and embossing, but the sentiment kinda melted into the bubbles in an ascetically unpleasing manner. Embossing both at the same time was much more satisfactory. To make a Frankenpineapple you need Carmen's Veranda Frankenstein and Carmen's Veranda Pineapple. These are both large stamps and they fitted perfectly together. 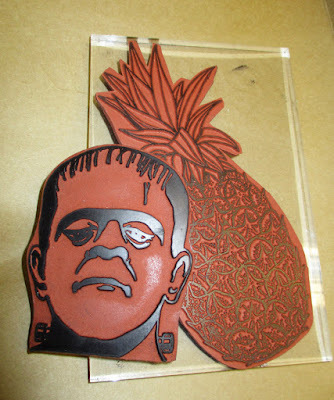 I stamped the pineapple on card and then stamped and embossed Frankenstein on tissue paper. I ripped around Frank and glued him in place on the stamped pineapple. 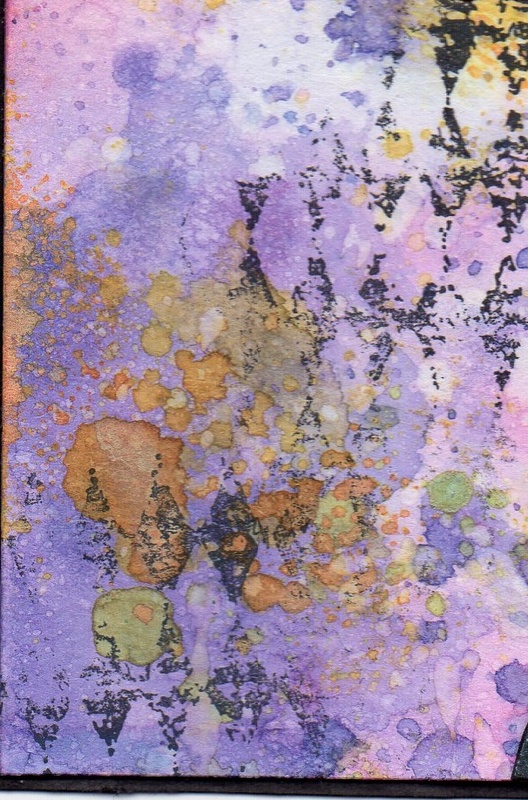 The ripped edge of the tissue paper blends seamlessly into the background, but the tissue paper may take colour differently from the background card. Just saying bwahahaahaha. 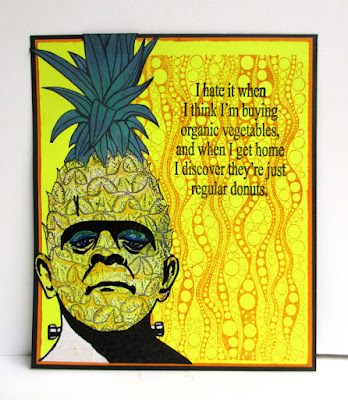 I coloured my Frankenpineapple with Promarkers and distress inks. A bit of galaxy marker for the eye-shadow with a touch of glitter and Frank is ready to hula. Our current challenge is Say What??? We need to see a wordy sentiment on your stamped creation. There are so many great sayings and quotes available, I am sure you have something suitable. 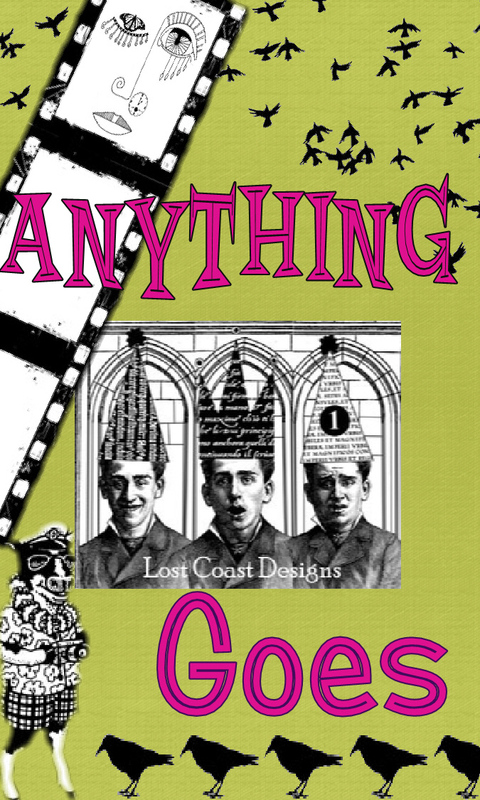 Link up your makes for a chance to win some Lost Coast dollars. CHALLENGE #49 - SAY WHAT?? Welcome. It's time for our new Challenge. 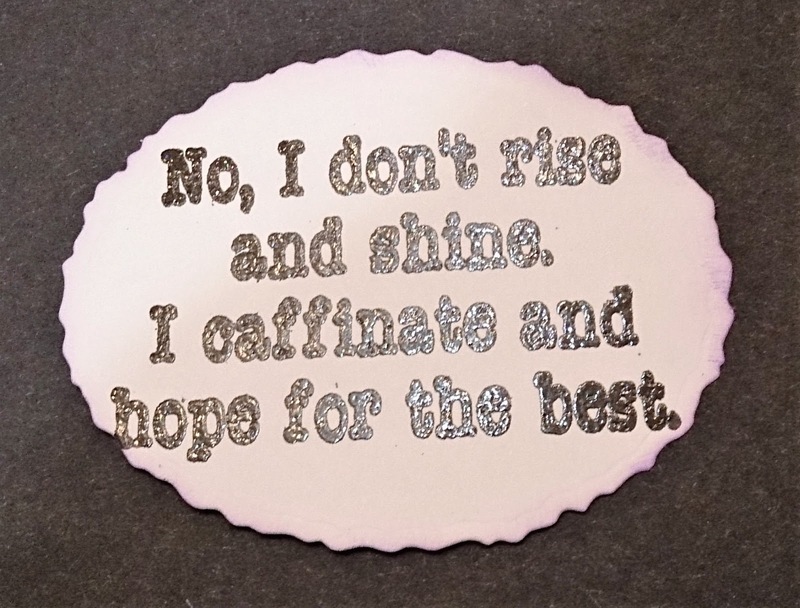 We want to see your stamped creations with a wordy sentiment or quote. The more words the better!! Leave those singles and pairs at home, we want to see whole sentences of wordy wonderfulness!! You are welcome to play in our Challenges using rubber or clear stamp images from any company but if you use any of our Lost Coast Designs or Carmen's Veranda stamps...we love it when you do...then your entry counts as two which doubles your chances of winning in our Design Team Faves prize drawing. If you don't have a blog then no prob, you can still play in our challenges by sharing your projects from public photo sharing sites which includes our Facebook Company Pages for Lost Coast Designs and Carmen's Veranda. 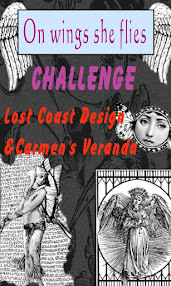 If you are using Lost Coast Designs or Carmen's Veranda stamps you can now also link up your challenge entry in the Lost Coast Official Fan Group on facebook. There is a challenge album in photo's. Please include our Challenge info and the link back to our challenge in your photo's description! As long as the privacy setting for your photo is public you're good to go. See, it's so easy to join the fun! FYI, you can't link up projects shared in closed Facebook groups! Now it's your turn! Are you up for the challenge? We can't wait to see your projects! Cathy here and I have a fun shaker card for you. As it says Anything Goes so...Shaker it is. I started off cutting a large circle from a nested circle die set. Then I stamped Raven Queen on it with Copic friendly black ink. Then I colored it in with Copic Markers. 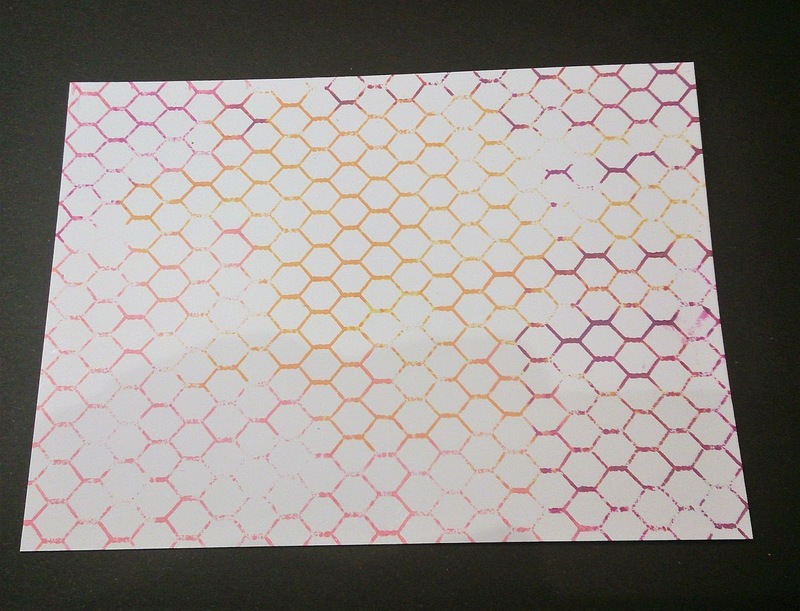 Next I cut out a circle from some transparency film. Then I used the largest and the second largest circle dies and made a ring from white cardstock. I then grabbed some sequences and glued some on the Raven Queen circle piece. Taped the transparency film to the cut out ring then added foam squares to it. 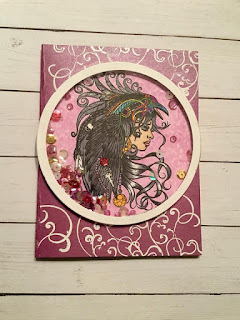 Then I added my sequences to it and then I took my circle that I stamped and colored Raven Queen on and put it together. Ta-Da. Shaker card on the way. 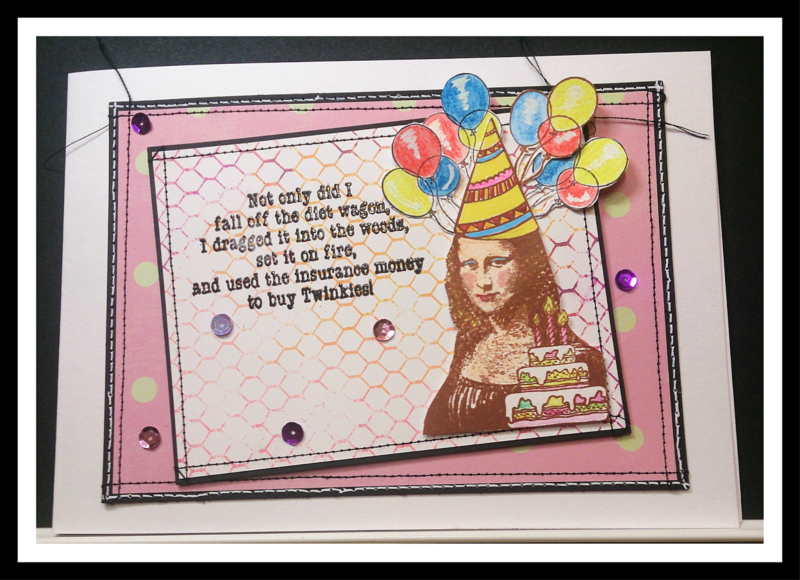 Then I grabbed a card base and stamped my corner swirl with Versa mark ink and embossed it with white embossing power. Then I glued the circle shaker to the card base and shaker card DONE..
Come on over and play along. You can enter here. Look Who's Fallen Off The Wagon! 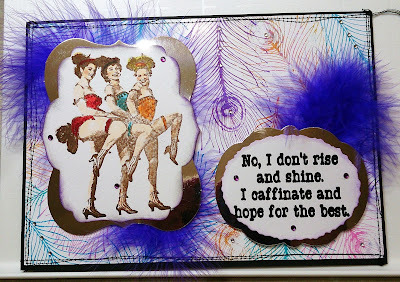 Good morning and happy Monday, it's Sue here with my second piece for our current Anything Goes challenge. 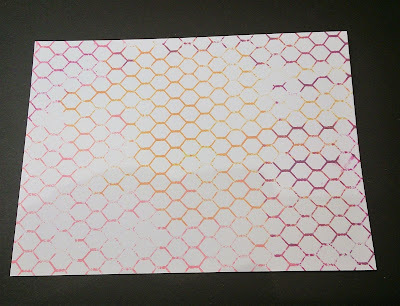 I started with this Large Chickenwire Background and stamped it with Distress Oxides in a few colours. 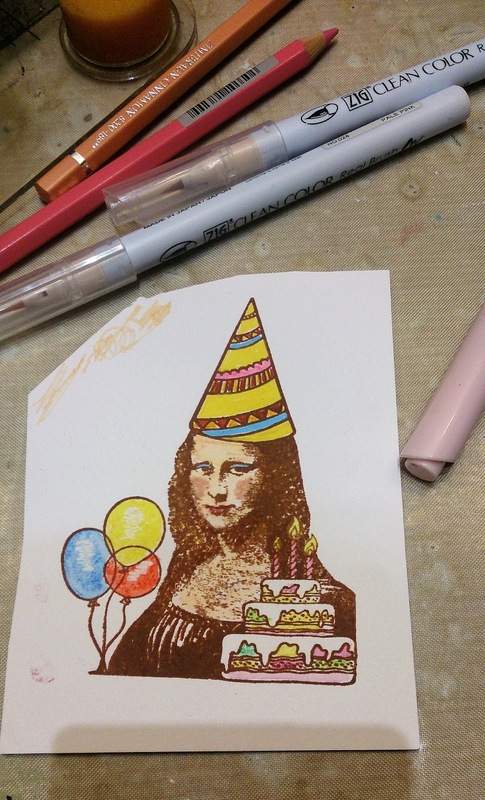 I just LOVE Birthday Mona, she is such fun! She's been coloured with watercolour pens and pencils then cut out. I also made some extra balloons - you can never have too many balloons. Then I just layered it all up and stitched together. It's not often that I make a card, but we are coming into the birthday season for my family, so I'm sure she'll find a good home. I hope that you like my card, and that you'll join in with our challenge. You have until the 14th, so you'd better get your skates on! going on at the Portal from the 1st until the 14th of this month. So it's your chance to get our your favorite stamps and make anything your heart desires! stamp. I positioned him to look like he is balancing on one of the doodle circles. I have him holding a little paper flower, and the saying is from the Pets Live Longer clear stamp from Carmen's Veranda. 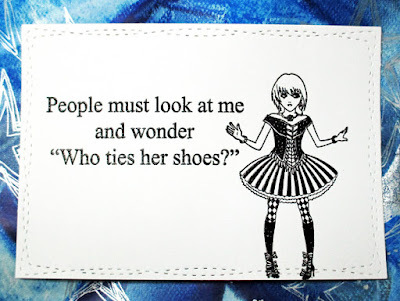 I cut out the part of the quote I wanted to use for this card. 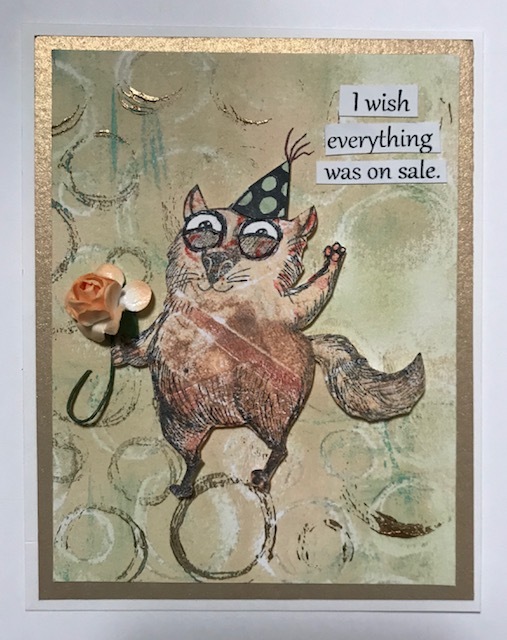 I layered the card with gold then white card stock, and this little guy is ready to get the party started wherever you are! 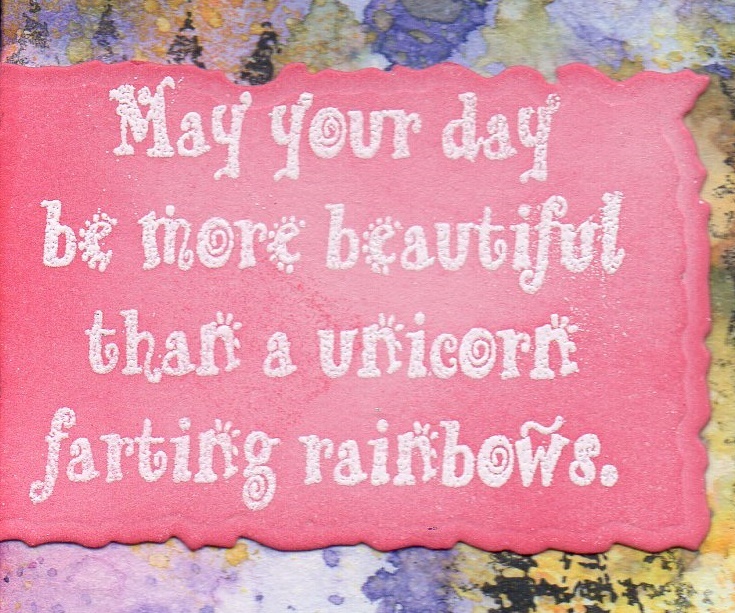 Cathy here with a shabby-ish card for you. Today I was playing with Large Elk Skull from Lost Coast Designs. 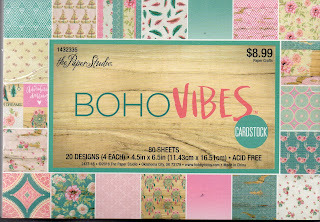 I chose my colors from BOHO Vibes paper pack. I trimmed the paper to fit on a A2 size card. I edged my paper with some distress inks and then I stamped Large Elk Skull with black ink in the center. 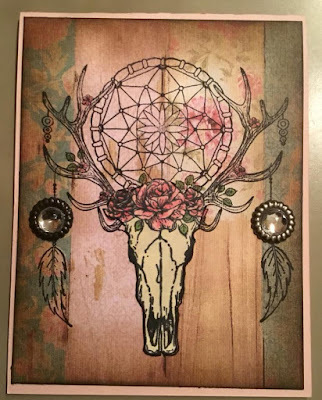 Next I grabbed a cream color cardstock and stamped just the skull and flowers on it with Copic friendly ink. Colored with Copic and cut out. Edged with black marker so you don't see the edge of the paper. After I glued the skull and flowers I grabbed some bling and added it where the mini dreamcatchers hang off the antlers. I hope to see your Anything Goes. You have a chance to win some Lost Coast or Carmen's Veranda bucks. Enter here. It's time to announce the WINNERS of the February Challenges! 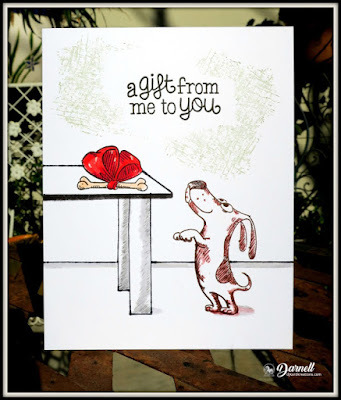 We would like to thank everyone who entered their lovely projects and it was so nice to see so many using Lost Coast Design and Carmen's Veranda stamps. You of course get an extra chance in the random draw for using our stamps on your projects. Thanks for playing with us! Unfortunately we had to discount a number of entries from the Boys Boys Boys challenge because they didn't comply with our rules. Please check the the rules. Projects that have been shared anywhere before the start of the challenge are nor eligible for the prize. We also supply a bit of blurb for what we are looking for for each challenge so do check that to make sure you comply with our theme. Anne made this fun curiousity with a whole bottle full of boys!! Congratulations! Anne please take the winners blog badge and display it proudly. Darnell please email Gail (craftynomad at gmail dot com) by the end of the month to claim your prize of a $10 gift certificate. Please provide your full name and mailing address in the email as well as the stamps you would like, you may choose from Lost Coast Designs and/or Carmen's Veranda! As long as it has rubber or clear stamping as the focus it fits our theme. Hello. Gail here today. Our challenge this fortnight is Anything Goes. 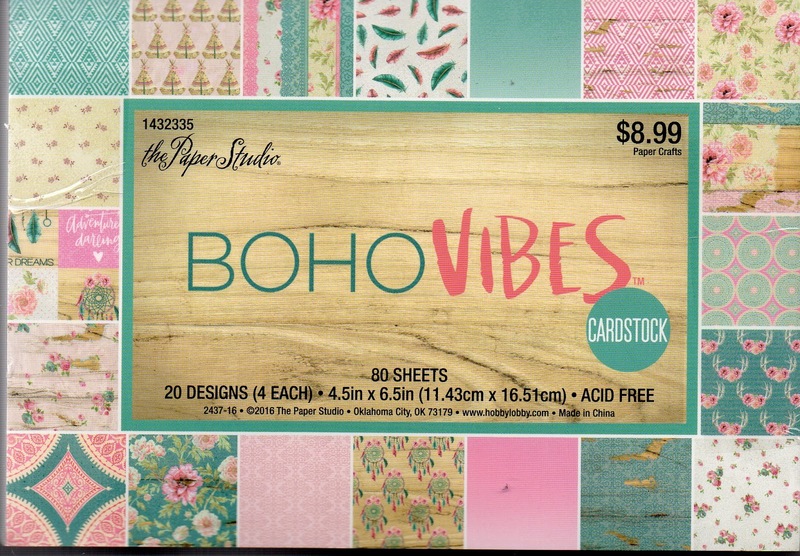 That means you can grab your favourite stamps and use your favourite style and techniques to make a stamped anything!! I have decided to embrace my love of all things CAS. 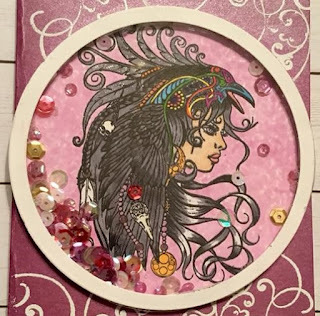 I stamped, embossed and fussy cut Carmen's Veranda's super sweet Quilted Wing Angel. I added some colour to her star, necklace and legs using a gold pilot marker. 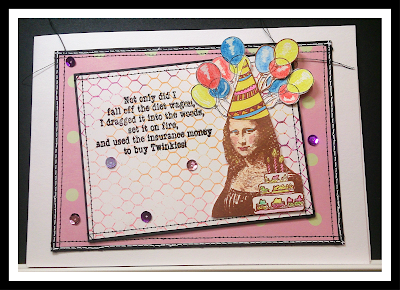 I used Stamploration dies to cut my happy birthday from gold mirror card. Done!! Link up your makes for a chance to win Lost Coast dollars!! Hello. Gail here today. Have you seen the new challenge theme?? It's Anything Goes!!! Here's an anything with a cat. I actually made this panel previously for a sketch challenge and never used it. Then this Katzelkraft cat dropped on it and claimed it as his own. I've stamped, black embossed and fussy cut him. I decided not to colour him cos that background is a little busy and I thought he would show up better black and white. I stamped the Carmen's Veranda sentiment Bottom of Wine Bottle and embossed it and tried to cut it into a wine glass shape!! See, this is why I used stamps and dies!!! Anyway, the cat said stop mucking about and hit it with some Salty Ocean distress ink, so I did! I hung this cute metal charm on a piece of embroidery thread around the cats neck. It's two wine glasses, cos Cat likes to be prepared and he also doesn't like to drink alone. Lost Coast dollars and check yesterdays post for cool inspiration from the team.